You might also be a candidate for dental veneers if you used to smoke, but now you have stopped. Smoking causes a yellowish or brownish discoloration of the teeth. These stains cannot be lifted with cosmetic teeth whitening gels, pastes or mouthwashes. A veneer can cover up the stain on the tooth and give you the beautiful smile that you deserve to have as an ex-smoker. Veneers are also a good choice if you have a tooth that is discolored as a result of a medical or dental therapy. Some people may have discolored teeth because of fluorosis or a medication that their mothers took before they were born. Radiation treatments and some medications may also cause one or more of your teeth to be discolored. An injury to the tooth may cause permanent discoloration. These problems can be fixed cosmetically with veneers. 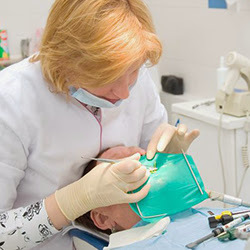 The dental veneers are only recommended if your teeth and gums are healthy and you have no oral infections or diseases. To learn more about veneers in Chicago, call us at Dental Professionals of Lincoln Park. You may also learn about dental veneers and our other cosmetic dental services by visiting us online.